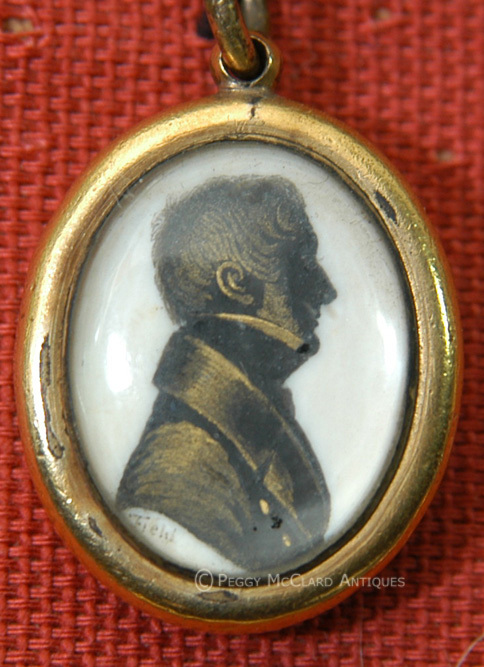 A lovely and rarely found silhouette painted on natural wafer in a tiny gilt metal pendant. This tiny treasure is painted in black with gilt embellishment and signed "Field". The back of the pendant has plaited hair. This silhouette is painted by Henry Williams Field (1810-1882), the son of John Field who learned his trade by working for decades for John Miers. Henry Field was somewhat of a child prodigy, exhibiting at the Royal Academy when he was only 12 years old. He worked with his father starting in at least 1822 (when he was 12). He painted both black and bronzed work on wafer (as well as some painted silhouettes on plaster). 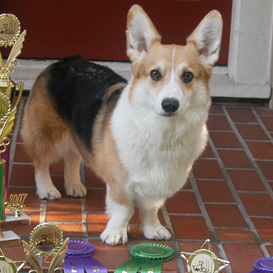 He assisted in frame making and metal jewelry work. Henry's work is similar to his father's but the pronounced dip of John Field's bust terminations is even more pronounced in Henry's work. In some cases, Henry's strokes of gilding are fewer and less fine than those of John. On black work, Henry's detail outside of the main body tends to be painted with a bit less clarity. A few examples of Henry's work are known with the signature "H. Field". Other silhouettes signed "Field" in the same hand as those signed "H. Field" must be presumed to be by Henry. 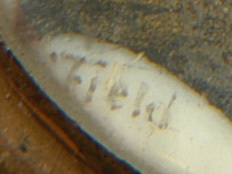 The signatures of Henry and John are quite similar although John Field, alone, sometimes wrote his last name with a small "f". This wonderful silhouette is attributed to Henry Field by both a comparison of the signature, a slightly coarser feel to the gold embellishment and the very pronounced dip to the bust termination. 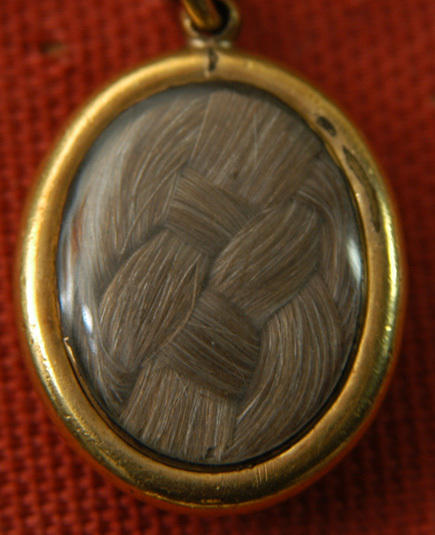 It is likely that Henry also made the gilt metal jewelry pendant frame and the plaited hair may be original. This is a rare, stunning and very wearable antique profile. Circa 1830. 3/4" tall. Exhibited: “The Age of Small Things”; curated by Chuck Webster, Dodge Gallery, 14 Rivington Street, New York, NY 10002, January 11 - February 23, 2014. Please see the Silhouettist Bios page for more information about John Field.